Who needs privacy when you've got Amazon? Not satisfied with tracking its warehouse workers using wearables, and making sure its Alexa virtual assistant has as wide a reach as possible, Amazon is pursuing a new way to get all up in people’s space. The company plans to take photographs of your front door. Smell a little dystopian in here to anyone else? Over the last six months, and with little fanfare, Amazon introduced a program that asks delivery drivers to provide visual confirmation of a package’s safe arrival — that is, a photograph proving the order was dropped off, and where. The standard-issue delivery device and operating system were updated to make it easier for delivery drivers to snap a pic before heading off to their next destination. Users can also access the images to confirm their package arrived safely – or to check where it ended up, in case your delivery driver took it upon themselves to hide it under a bush in your back garden. However customers can only see the photos by going to their order history, USA Today reports. 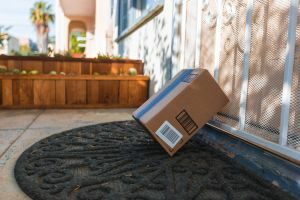 If an Amazon package is lost during the delivery process, or stolen from outside the recipient’s home, the photo gives customers extra proof, and Amazon would typically provide a replacement, free of charge. That’s a nice perk (though, to be fair, Amazon will usually do this anyway — a customer service feature some people have figured out how to make money from). But there’s also a downside, if you care about privacy. Snaps of your front door end up on the Amazon servers where you can’t do anything about them. Someone else might be able access them, however: hackers. Granted, leaking your home address might not make you as vulnerable online as, say, leaks of your credit card number or passwords. But it’s still not exactly ideal. If photos of your front door are dumped on the internet for everyone to see, or take advantage of, you might be subject to scams or abuse, such as doxxing. And it’s happened to Amazon before. One hack of Amazon subsidiary Zappos in 2012 affected 24 million customers, according to a Las Vegas Sun article about a subsequent lawsuit against the company. “But the lawsuit says customers nevertheless have to worry now about being targeted by identify theft schemes or even ‘phishing,’ in which a criminal may pose as being with Zappos, set up a fake Zappos website and try to contact customers to gain their bank account numbers, login information or Social Security numbers,” the article reads. Some Amazon customers might welcome getting a notification on their phone showing them their package is waiting on their doorstep. Others might find it to be an invasion of privacy, but remember we’re talking about a company that wants you to give them a set of keys to your house to make deliveries easier. Amazon’s Photo on Delivery program is currently being tested in Oregon, Las Vegas, Indianapolis, Seattle, San Francisco, and the Northern Virginia metro areas. If you live in one of those places and you feel squeamish about the whole thing, you can opt out by clicking “Don’t take delivery photos” on the “Your Orders” page on the website. But you can only choose that after Amazon has delivered at least one parcel at your door — and snapped that first photo.